At the heart of our faith is Christ. At the heart of Christ is his bridegroom, the Church. Never before in history has the means of disseminating information about the Catholic Church been as available as it is today. 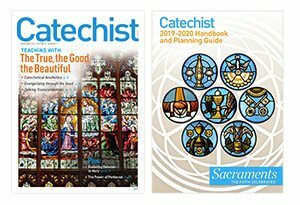 The availability of the Catechism of the Catholic Church and its youth counterpart, YOUCAT, aid us marvelously in this endeavor to understand, discern, and teach the faith as Christ intended by means of his Church. YOUCAT educates both catechist and student about the fundamentals of our faith. A simple question-and-answer format makes it easy to understand and follow. The great subject index — located at the back of the book — facilitates topic searches. With pictures, Scriptural cross-references, and quotations from the saints, YOUCAT aids one in understanding Church teaching. YOUCAT’s overall structure assists catechists in our lesson planning, and it is a great benefit for our own continued faith formation. The Nicene Creed is expressly reviewed in the first section of YOUCAT. I begin with this prayer on the first day of class, taking time to explain its parts to all of my students. The Creed states exactly what we believe, and it stems from the earliest days of the Church. For someone who may be sitting in the church pews for the very first time on any given Sunday — maybe discerning whether or not to become Catholic — our Creed can be especially significant and informative. By repeating our Creed week by week, we are reminded of our beliefs and our hope in eternal life. YOUCAT informs with truth revealed to us by Sacred Scripture, Sacred Tradition, and the Magisterial teaching of the Church. It offers detailed sections on the origins of our liturgy and sacraments. Students are able to see and meet Christ through these important expressions of our faith. They can read about everything relating to the sacramental life of our Church, as well as how we are to live as members of the body of Christ. YOUCAT gives students the means to recognize heresies contradictory to Church teaching and sort truth from falsehood. Controversial topics that permeate our culture are also addressed within YOUCAT — topics relating to marriage, sexuality, war, abortion, the occult, and so on. Students can rely on YOUCAT when they have questions about these subjects. Catechists can ask students to name some of the issues of our day and then look them up in YOUCAT together to discover just what the Church has to say about them. This teaches the students how easy it is to find answers to seemingly tough or even “novel” issues of the day. More importantly, it helps to form their consciences in the light of truth and the dignity of the human person. 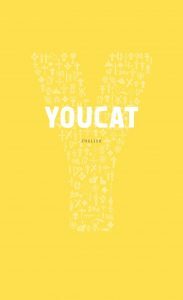 YOUCAT is a resource that we, as catechists, can feel comfortable using, as a “sure norm” for correctly passing on the faith. YOUCAT demonstrates how to live the Christian life by the example of Christ’s love for us. Through a comprehensive explanation of the Beatitudes and the Ten Commandments, teens are taught how to “love thy neighbor.” Even though teens may have been exposed to the Ten Commandments and the Beatitudes in their primary years of catechesis, going over them again at this stage in their development offers new awakenings and understanding on their part. They are able to discuss the Commandments, the Beatitudes, and their implications on a much deeper level. Each commandment is expounded upon so that teens are able to clearly see the connections between God’s commands and sin, between charity toward one’s neighbor and the lack thereof, and between the acceptance of God’s great gifts of love and mercy for each one of us and one’s refusal to accept these gifts. YOUCAT loves our teens by teaching them that they can have a personal relationship with God. They are actually invited to this personal relationship with God through prayer. The love of God shines through as they come to understand that God desires to have a relationship with them. He loves them personally, uniquely, and intimately. There is nothing a student cannot share with God, or ask his assistance for. YOUCAT teaches what this communication looks like and suggests its various forms of prayer. Studying YOUCAT’s section on prayer is the perfect time to review the Rosary, the Chaplet of Divine Mercy, and any number of other prayers and novenas with students. 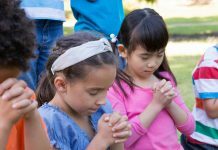 By taking the time to teach students the origins of these prayers, they are able to see Christ manifesting himself personally in the lives of individual members of his body, the Church. It is also an opportunity to teach them about the angels and what our Church has to say about them. Students are often amazed to learn — some for the very first time — that they each have a personal guardian angel assigned and given to them by God. 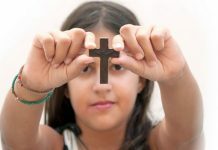 These four inherent gifts within YOUCAT are essential for equipping our youth to combat the evils and trials of our day. As a catechist, I find these gifts to be the divine fruits that await those who engage in its study. Much like all four chambers of the human heart are necessary and work together to renew, sustain, and nourish the body, the four gifts of YOUCAT refresh, sustain, and nourish the faith of our present and future Church. Kimberly Bruce is currently pursuing an MA in Theology in Catholic apologetics. She is a Life Teen catechist at a Massachusetts parish and an author.